Kevin Durant’s name has been sprinkled into many different rumours over a dramatic couple weeks in the NBA, but the one person who has had nothing to do with them is Kevin Durant. The only thing that Durant did publicly for nine straight days, was play basketball. And that’s all he really wants to do. He has made it clear that he doesn’t like the media’s role in his sport and when his name starts popping up online, he often disappears (From the media at least, he still makes it rain on the court). 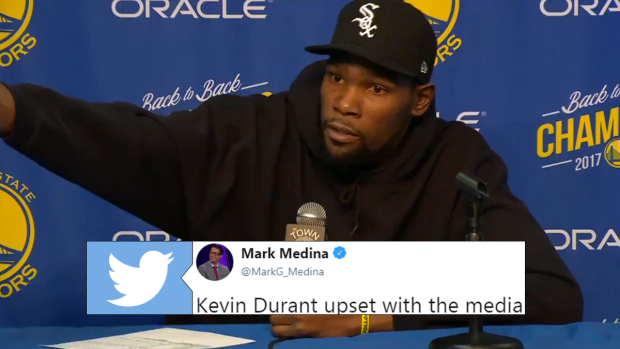 The nine-day streak of not speaking to the media ended last night and Durant went off, directing much of his anger at one specific reporter: Ethan Strauss. ICYMI: Kevin Durant on why he hasn't been talking to the media lately: "I just don't trust none of y'all." The article that Durant is probably referencing is one titled “Silent star: On the presumed Warriors’ exit of Kevin Durant”. The article basically talks about Durant avoiding the media and loops back to the reports that there are strong implications that the Knicks expect to sign Durant in the offseason. Obviously, KD disagrees and it kind of comes down to a chicken or the egg scenario: Durant is mad that Strauss wrote the article without speaking to him, but he also won’t speak to media. In the end, all this has really done is fan the flames of a story that had kind of died out. Now people will be talking about this for a little while longer and probably making jersey swaps.